Music hall songs often presented idealised pictures so that audiences could immediately recognise the genre of music they were listening to; comic, romantic or political. Different types of people were caricatured and areas were stereotyped and distorted for popular entertainment. 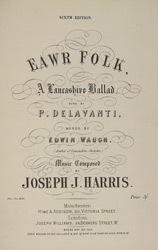 'Eawr' is a term used in Lancashire dialect to mean 'our', thus this ballad is about the inhabitants of Lancashire. Lancashire dialect is one of the oldest, if not the oldest, form of spoken English in the world and developed from Anglo- Saxon.